رمبرانت (اینگیلیسجه: Rembrandt Harmenszoon van Rijn)، (دوغوم: ۱۵ جولای ۱۶۰۶ - اولوم: ۴ اوکتوبر ۱۶۶۹) بیر هولندلی نقاش ایدی. The Stoning of Saint Stephen, 1625, The first painting by Rembrandt, painted at the age of 19. 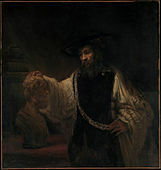 It is currently kept in the Musée des Beaux-Arts de Lyon. ↑ Or possibly 1607 as on 10 June 1634 he himself claimed to be 26 years old. See Is the Rembrandt Year being celebrated one year too soon? One year too late? and ( دیلینده) J. de Jong, Rembrandts geboortejaar een jaar te vroeg gevierd for sources concerning Rembrandts birth year, especially supporting 1607. However, most sources continue to use 1606. ↑ Starcky, Emmanuel (1990). Rembrandt. Hazan. p. 45. ISBN 978-2-85025-212-9. ویکی‌آمباردا Rembrandt ایله مربوط فایل وار. 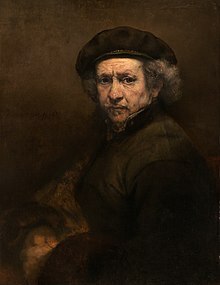 The Rembrandt Database. 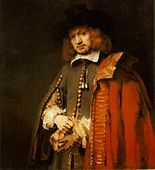 A Web site with research data on the paintings, including the full contents of the first volumes of A Corpus of Rembrandt Paintings by the Rembrandt Research Project. بۇ صفحه‌‌ سوْن دفعه ‏۱۹ مارس ۲۰۱۹، ‏۱۸:۳۹ تاریخینده دَییشدیریلمیشدیر.